Unlike other types of scientists, volcanologists are limited in their ability to get a first-hand look inside what they're studying. They rely on an array of tools to give them information. These highly sensitive tools enable them to keep tabs on everything from earthquake activity to changes in the slopes of the volcano's surface to the types of gases emitted by the volcanoes. Volcanoes and the area around them are a hotbed of earthquake activity, and an increase in the amount of earthquakes can be an indicator of impending eruption. Seismometers or seimographs detect and record earthquakes. These sophisticated devices measure the intensity, escalation and epicenters (the origin point of activity) of an earthquake. The Big Island of Hawaii has more than 60 seismic monitoring stations. Because it is impossible for scientists to see inside a volcano, they use thermal imagers to take pictures of the heat emitted by a volcano. The images show which lava flows are hotter, thus newer, and which are cooler, thus older. Global Positioning Satellite (GPS), Electronic Distance Measurement (EDM) and standard leveling instruments measure changes in a volcano's ground formation. The tiltmeter, for instance, measures "the slope angle of the flank of a volcano." As magma accumulates under the surface, the pressure exerted causes the surface to expand. The Hawaiian Volcano Society uses tiltmeters that can "measure changes in the slope as small as one part per million." Volcanologists can tell what is happening beneath the surface of a volcano based on the gas it is emitting. Changes in the amount of carbon or sulfur gases can mean a new influx of magma, while malodorous hydrogen sulfide gas can signal an impending eruption. Obtaining these samples can be dangerous, so scientists use a spectrometer. Each type of gas has its own distinctive light signature, so this device, which analyzes light coming through a volcanic plume, can give scientists the information they need from a safe distance. Radar instruments, carried by planes or satellites, provide incredibly detailed, three-dimensional maps of the volcano's surface. 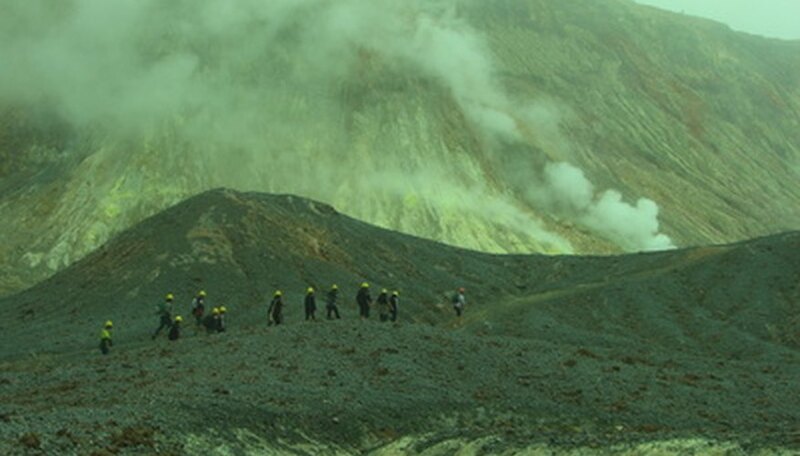 Using these images, volcanologists can predict flow patterns of magma or mudslides. These images are also helpful to local officials in figuring out evacuation plans in the case of an eruption. Public Broadcasting System (PBS): Nature, "Violent Hawaii: Volcanologists' Tools"
U.S. Geological Society: Cascades Volcano Observatory, "Volcano and Hydrologic Monitoring Techniques"
Sarah Baczewski comes from a family of authors and has been writing professionally as a novelist/screenwriter since 2005. Her areas of expertise include film, television, theater, travel and books. Based in Los Angeles, she works in talent/literary management. Baczewski earned a Bachelor or Arts in theater from Whitman College and a certificate of completion from the Seattle Film Institute. What Instruments Can Be Used to Predict a Flood? Baczewski, Sarah. "What Tools Are Used to Study Volcanoes?" Sciencing, https://sciencing.com/tools-used-study-volcanoes-6618842.html. 25 April 2017. What Are the Types of Volcanic Explosions?